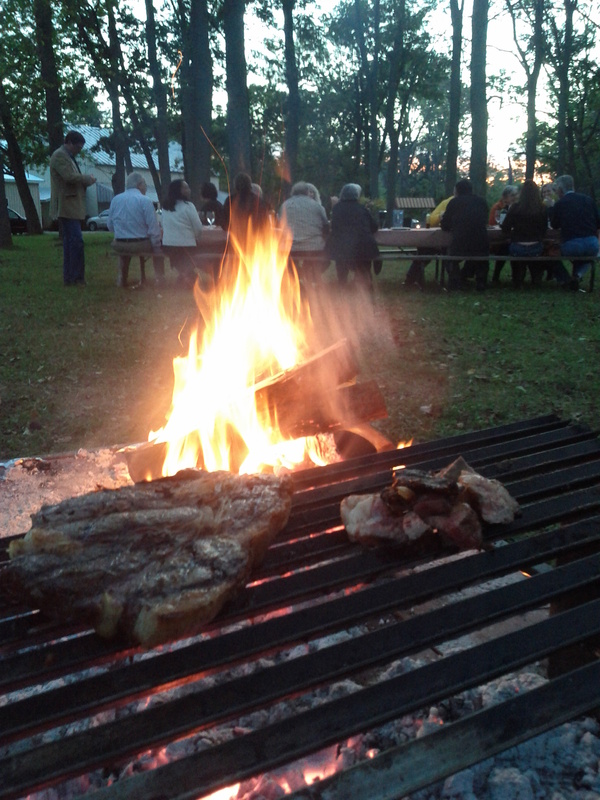 La Pampa Grill – Argentine traditional wood fired grill. For our monthly calendar, find us On the Street, here! Interested in a Private Party? Find out more! *Please note: this special has sold out, but keep your eye out for more future events! Like us on Facebook to stay updated! 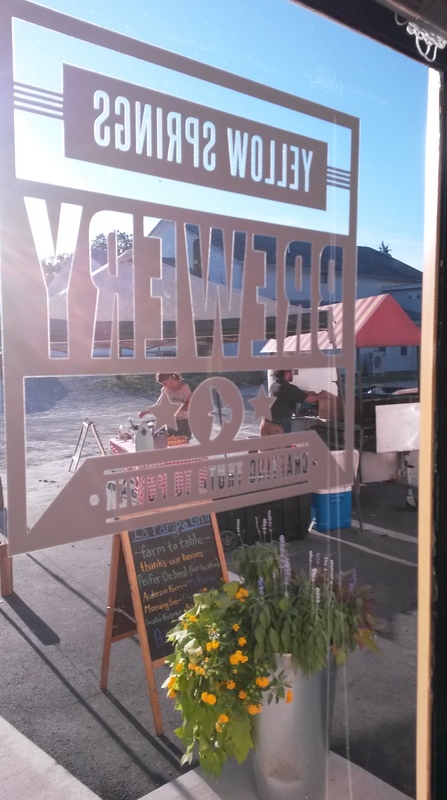 La Pampa is offering locally raised, grass-fed real Angus steak on Sunday, June 19th, Father’s Day, as part of our evening of grilling at Yellow Springs Brewery. Adding to our regular menu offerings that day, we will have a limited number of nearly 20 ounce steaks, grilled, sliced and served on a cutting board to share between your table of two to four people. These thick, whole steaks will be grilled over hardwood fire—as Argentine tradition mandates—and offer an authentic taste of real Angus to be enjoyed, in the Argentine style, shared at a table with friends and family. Mariano has been dreaming about getting Angus steak on La Pampa’s menu, and is preparing for this Father’s Day offering with his local butcher and the family farms in Hardin County, Ohio. He will grill the steaks as a staggered, pre-ordered service between 5-8pm. We will communicate directly with each group that has pre-ordered to coordinate the timing, so that they may either arrive early to find a table, order their beers, and relax as their steak is grilled, or arrange to take it (and some of YS Brewery’s finest) home. The number of steaks available is limited. We are currently sold out! The cost of the Angus steak is $70. Please email: gitanorios77@gmail.com to reserve your steak, and arrange for the pre-ordered payment. We hope that this will be the first of a number of steak specials throughout the season, always in coordination with the availability at area farms. For more about La Pampa Grill and our farm to street business, follow our About Us page here. La Pampa’s Argentine traditional wood-fired grill joins The Emporium for a wine tasting and degustation of local Angus beef steak. Mariano will grill using selected hard wood and fire bringing the authenticity of Argentine flavors to Ohio-raised An gus. Kurt has selected his favorite Spanish wines to pair with the small plates. The cost is $50 per person, and by reservation only. Deadline for sign up is June 1, 2016. You can reserve your seat at the table by email to realgone1@sbcglobal.net, or by calling 937-767-7077. Be sure to make your reservations early, seating is limited! More details on the menu and wines will be forthcoming….! This event is limited to participants 21 and older only. Keep a lookout for Father’s Day Ribeye special at The Yellow Springs Brewery! It’s getting colder and December weather is unpredictable, to say the least. La Pampa is making an effort to maintain hours open to the public this month, but weather disruptions may be likely. Please check our Facebook page on the day of your visit or call Mariano to check in! 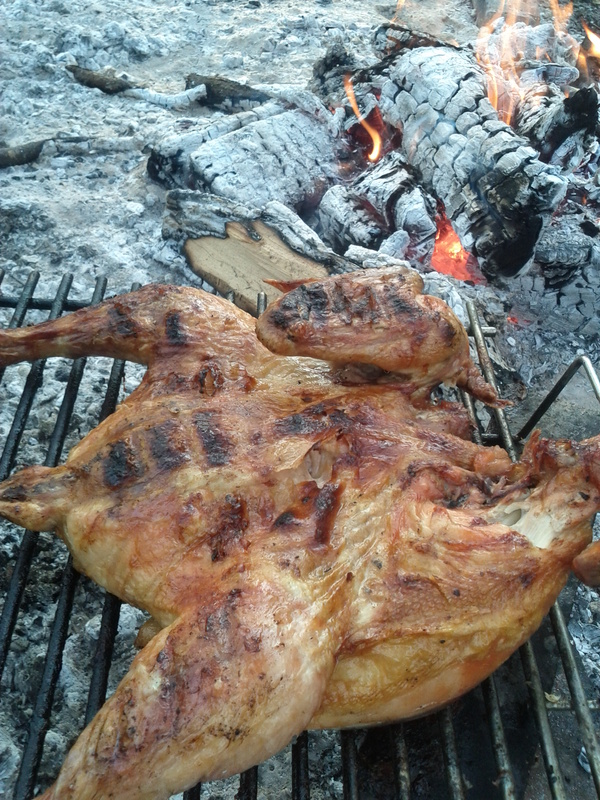 La Pampa is planning to grill at Yellow Springs Brewery on Dec 12, 13 and 18th, weather permitting. Check for updates on Wednesdays for lunch at the Wellness Center at Antioch College from noon – 2pm. For questions or more info, contact us. In its fourth year, La Pampa Grill’s popular tradition of cooking wood-fired turkeys for Thanksgiving dinner returns. This is a particularly wonderful helping hand for those of you who would like a special main course at your Thanksgiving table, while you can focus on preparing the rest of the meal. Each interested family purchases their own local turkey (please order from our local farm friends Flying Mouse Farm; Morning Sun Farm; New Liberty Farm; or Bowman Landes’ turkeys available to order at Tom’s Market in downtown Yellow Springs) and brings it the day before Thanksgiving for prep. La Pampa will cook the turkeys over the wood-fired grill on Thanksgiving Day, to a prearranged set schedule for your meal time. Families pick up their turkey to take straight home to their Thanksgiving table! La Pampa has decided to suspend its next family picnic-style parrillada party planned for Saturday, October 24, due to the rain in the forecast for both Saturday and Sunday. We’ll have to wait until spring for our next parrillada! Meanwhile, La Pampa will continue to be at The Wellness Center at Antioch College for Wednesday lunches, and Peifer Orchards this Friday, Oct 23 and Saturday during the daytime. 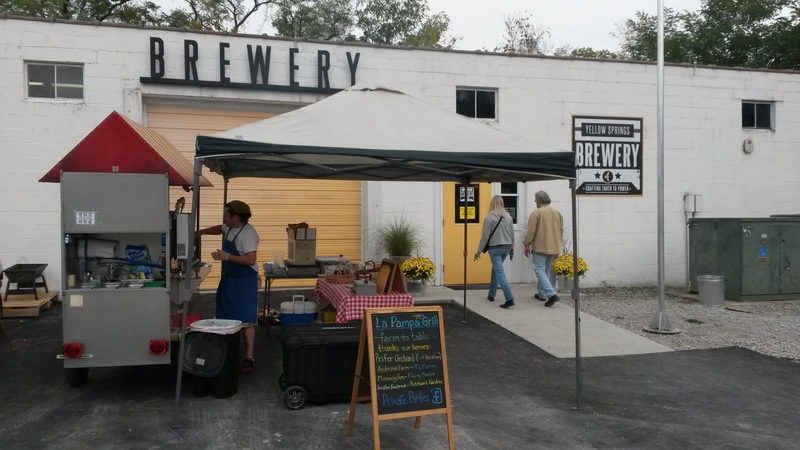 Sat, October 10 – La Pampa will be grilling at Yellow Springs Brewery for the Yellow Springs Street Fair from 1pm on. Friday, October 9 – we will be at Eudora Brewing Company (4716 Wilmington Pike in Kettering) from 5pm-8pm. And don’t forget Wednesdays for lunch at The Wellness Center at Antioch College – noon-2pm! La Pampa will hold its next family picnic-style parrillada party on Saturday, October 24, at Peifer Orchards. For reservations, see below. For directions to Peifer’s, click here. 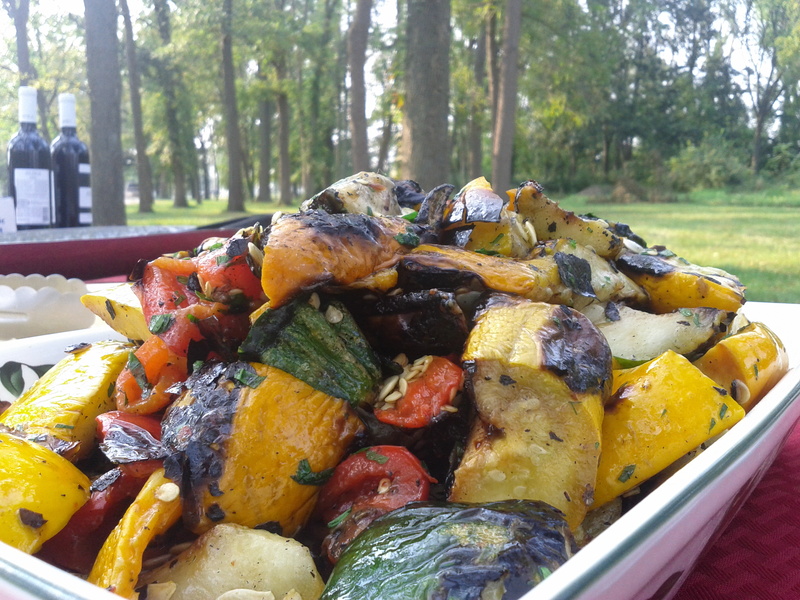 Local chicken and beef (asado al asador) will be on the grill along with seasonal vegetables coming from area farms. Please bring your own sides and salads to enjoy, as well as drinks (wine, etc). 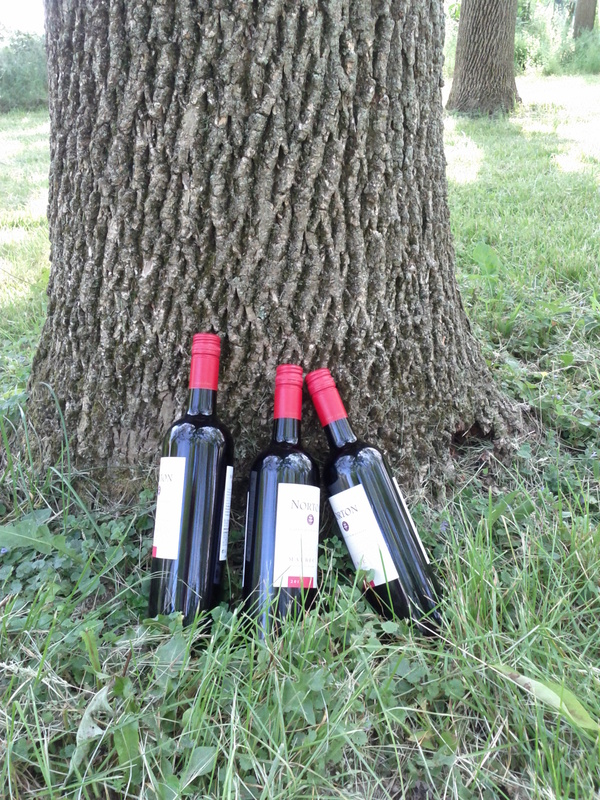 We will provide a “wine reception” for a toast and welcome. We encourage everyone to bring picnic blankets and/or chairs to spread out and enjoy the evening. Use the PayPal button below to reserve your spot by buying a ticket(s) directly. La Pampa will be in touch with a confirmation email. If you prefer to send a check in the mail, please send us an email to let us know. Space is limited for this event. Sat Oct 24: 4:30pm-5:30 welcome reception, 5:30-7pm dinner. $20 per adult. Kids 12 and under are free. *Note: PayPal users, the date in PayPal indicates Sep 5. Ignore this date. Tickets are for the Oct 24 party. Here’s a glimpse at our upcoming schedule. Stay posted on Facebook for additional details or contact us! Mark your calendars: La Pampa will be at Yellow Springs Brewery, Saturday, October 10, for the Yellow Springs Street Fair! 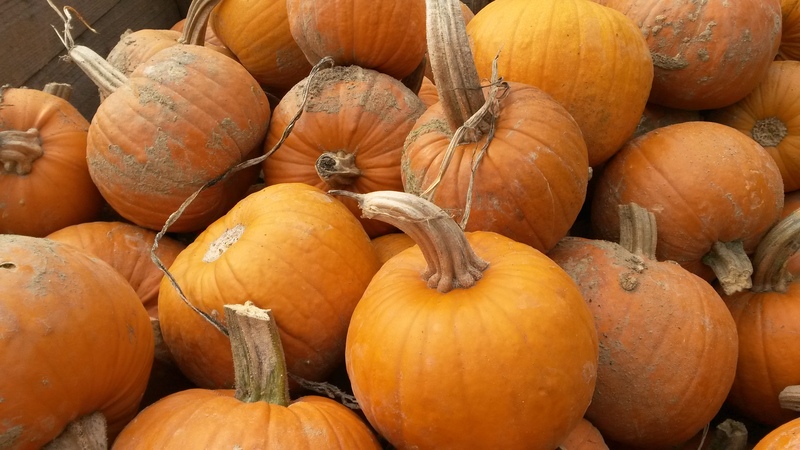 Hurry before the first frosts finish off the season’s abundance of vegetables! 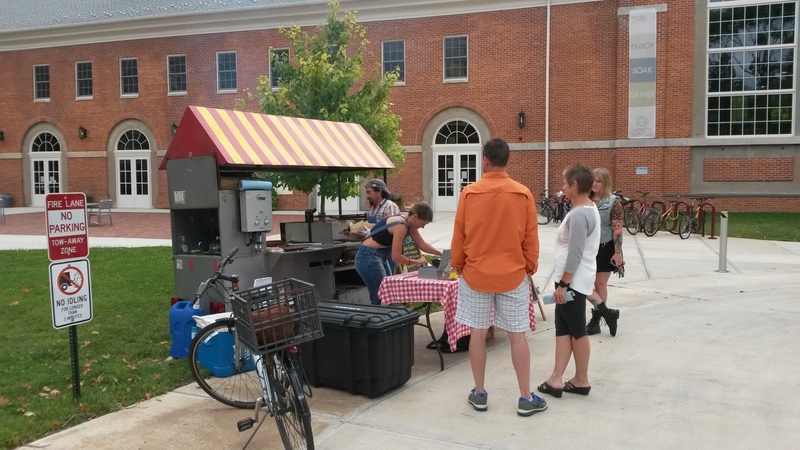 This Wednesday, as every Wednesday, La Pampa is grilling for lunch at the Wellness Center at Antioch College from noon – 2pm. 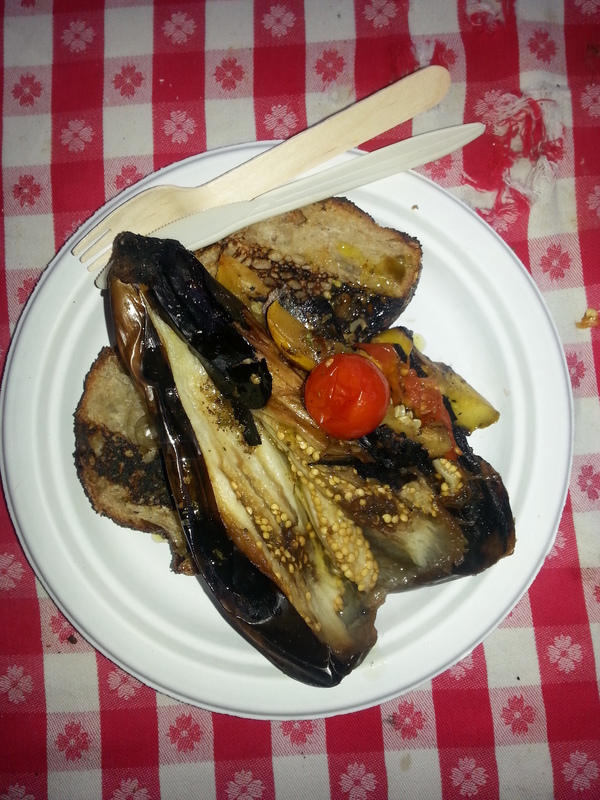 This week’s vegetarian special is our version of ratatouille on Blue Oven toast. We’ll also have “Chori-pan” Argentine Subs, of course, and Palara Farm’s Italian chicken sausage. For directions to the Wellness Center, click here. Clifton Festival and more upcoming events! The Clifton Gorge Music and Arts Festival is Friday, August 28th, 2015 | 4 pm – 11 pm & Saturday, August 29th, 2015 | 10 am – 11 pm. 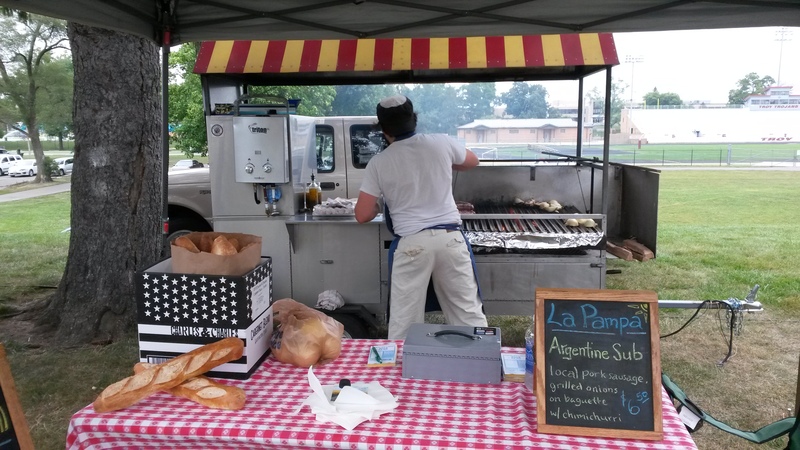 La Pampa will have its classic Argentine Sub, the “chori-pan,” and local, non-GMO, corn on the cob. Check out the music line-up along with kids activities, directions to Clifton and more, here. 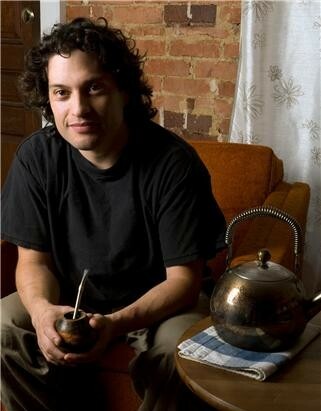 Monday, August 31, La Pampa will give a free presentation at the Yellow Springs Library at 6pm. 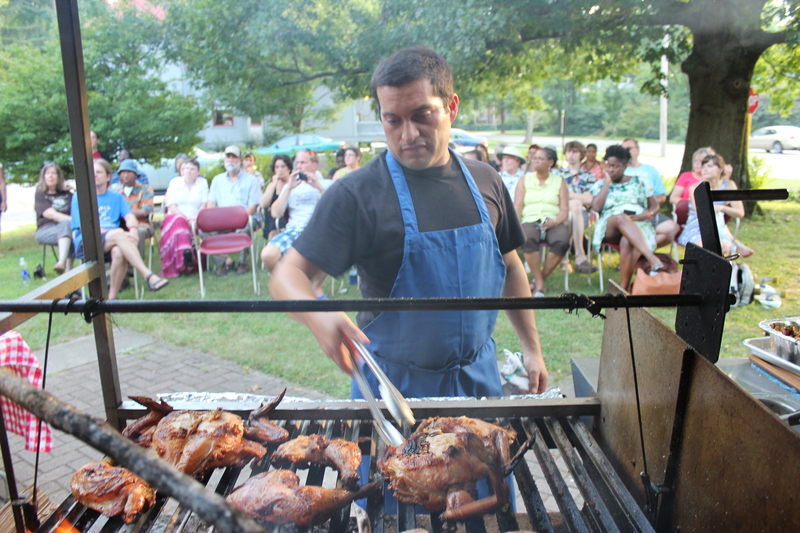 Mariano will demonstrate Argentine traditional grilling techniques and has invited local farmer and food friends to share more about their farm practices and nutrition. Free tasting included! Register with the YS Library, here. Space is limited. Every Wednesday, La Pampa is at The Wellness Center at Antioch College serving lunch from noon – 2pm. Sunday, September 6, we’ll be back at the Yellow Springs Brewery! For directions, visit the YS Brewery’s website.